Note: the 'first' Jungle Book is what I would like to focus on, it is the original and predates the Second Jungle Book by one to two years. Kipling was born and raised for six years in India, he was then sent to England where he completed his education at the United Services College. In 1882, when he was sixteen, Kipling returned to his native country and started writing short stories for an Anglo-Indian newspaper. I will be reading my own 1927 Doubleday copy. The local library had an 1899 copy published by the New York based Century Company. But it also had an unabridged, illustrated version! The Jungle Book, by Rudyard Kipling, Illustrated by Jerry Pinkney, afterward by Peter Glassman, published in 1995 by William Morrow and Company as a part of their Books of Wonder compilation. 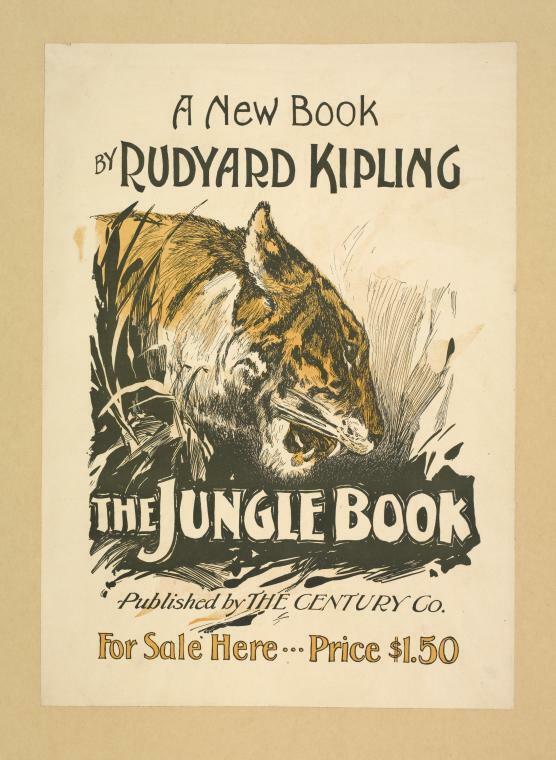 Since Kipling's writings were originally published with illustrations I think it is fitting that we may read them in that way. I hope you have an adventurous journey in the jungle this month and will bring your favorite moral to discussion at the trips end. I'm looking forward to this read, having never had any exposure to Kipling except by way of Disney! This promises to be a fun adventure. Who else is "in"?! 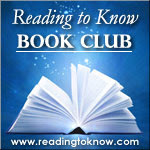 Leave a comment letting us know if you are planning to read along this month! This looks like it would be fun. I've never read it either and it sounds like a fun "easier-than-what-I've-been-reading" book for this month! I've been wanting to read this book since watching the Disney movie as a kid, but I've never gotten around to it. Now I have some extra motivation! @Julie - Same here! :) I'm so glad that Sky picked this one! 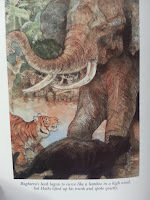 The kids and I have finished the first jungle book, and are starting the second. I read these several times when I was a kid, and would definitely recommend the second one as well. The King's Ankus is probably the best of that book. I would agree that it is a bit earthly. What bothered me the most was the casual racism, which I did have to explain to the kids, continuing the discussion we started in Tom Sawyer. I'd love to revisit the Jungle Book. My daughter is still too young so I'll be reading it alone or with a niece or nephew. But I'm still in!